I hated weddings as much as I loved football. I’d been dressed up as a flower girl and dragged to far too many of my parents’ remarriages to believe any union would last. My sole purpose became glowering and gorging on cake. The last time my dad got married, I wore black. I spent the reception with my siblings in the bar, cheering on the Broncos. Wife #Whatever was ticked, but hey, the Broncos make the playoffs less frequently than my parents get divorced and remarried. Priorities! I loathed the bouquet toss most of all. I always felt like I’m watching cows mowing each other down in order to enter the slaughterhouse first. At the last wedding I attended, I fled the dance floor when the DJ announced the bouquet toss. Well, I tried. I was a salmon flailing against a current of sequins. One frantic woman employed some vicious elbows. When friends of my Chinese-American boyfriend Andy got married, there was the inevitable bouquet toss. But there was not a hint of shoving. There were at least three hundred wedding guests, but they were predominantly Japanese-American, and very polite. Unfortunately, the crowd was also very, very short. I am not short. And as the tallest woman in the room, I was also highly visible. Flight was not an option, not once the bouquet toss was announced. Not unless I wanted to appear rude. But this was not my first rodeo. Next up, Plan B. I ostentatiously positioned one newly engaged woman at the front and center of the diminutive crowd, winking at the bride. Then I skirted the edge of the large dance floor until I was a good twenty yards back, as far away as I could get without sitting in the lap of an elderly gentleman. I should have been safe. 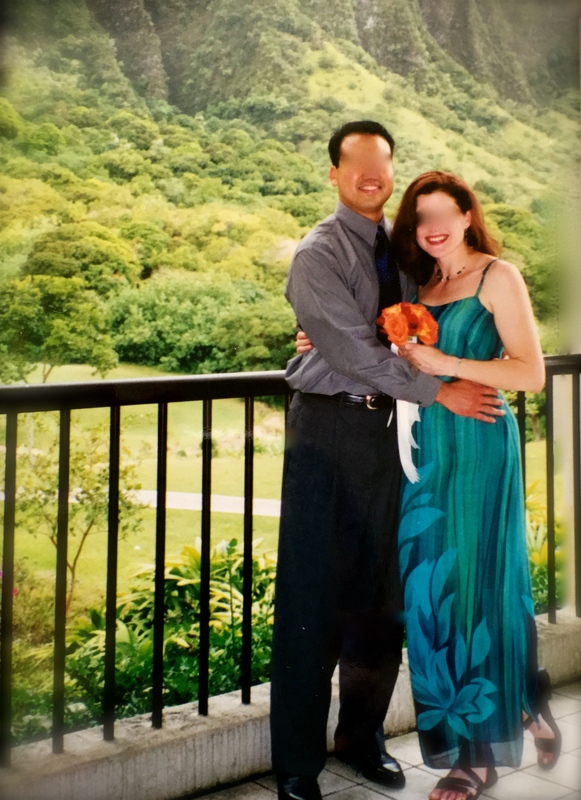 Hell, I would have been safe, if the bride hadn’t been taking ma huang diet pills to fit into her dress. Instead of a light toss, the bride heaved a bomb – backwards, in high heels – that Elway would have envied. Normally that bouquet would have hit the ceiling and ricocheted straight to the floor with an ugly splat. But this massive reception hall of windows had cathedral ceilings, the better to show off the gorgeous Hawaiian scenery outside. That bouquet sailed far over the heads of the five-foot crowd. Alas! For a moment the roses morphed into a football spiraling toward the back of the end zone! Alas again! My competitive reflexes took over. I was Ed McCaffrey. I jumped, touched the pass with outstretched fingertips, and hauled it in, scoring the winning touchdown! 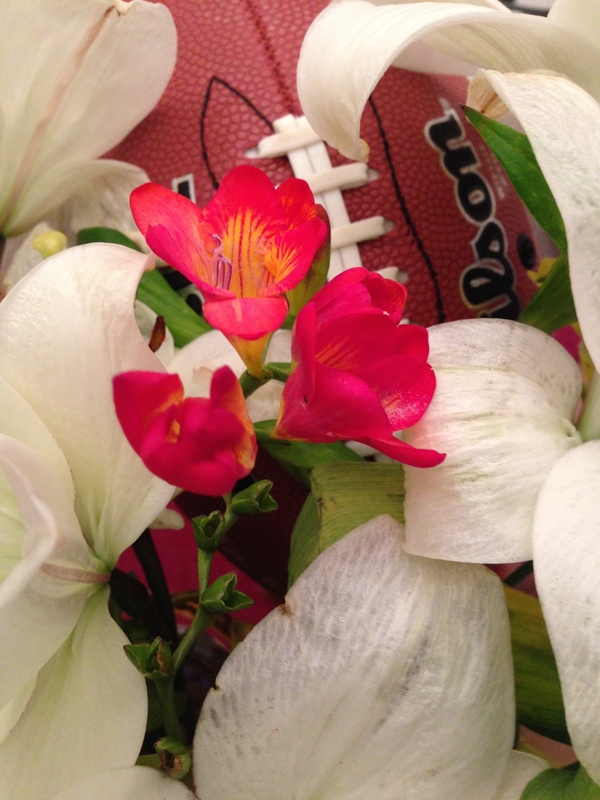 I almost spiked the ball bouquet and did victory dance before I came back to reality. McCaffrey never did victory dances. He was a class act. Someone insisted on a photo afterwards. See? No heels! And so ended my excellent bouquet avoidance record. As I looked at the sunset-colored flowers in my hand with growing horror, the women clustered around me, offering their excited congratulations. They laughed and gave me knowing looks. But they didn’t know the truth. I cracked my neck left, then right, and lateralled the flowers at him. * I stopped watching the NFL recently, when the media spotlight began to illuminate the traumatic brain injury cover-ups, the rampant domestic abuse, and the fact that the NFL pays no taxes. Yeah, that’s right. NO TAXES, thanks to special Congressional legislation. I know, it’s so unbelievable you’ll have to Google it. Google the petition to demand they pay taxes while you’re at it! Very funny … I had a similar McCaffrey moment at a cousin’s wedding. Type faster – can’t wait for more! Thank you for my very first comment! Did you trample lots of tiny Asian feet in your quest for the bouquet? Andy swears I did. At least I wasn’t wearing heels. Just so you know, #87 was a Giant before he was a Bronco. They made a terrible mistake letting him go. I did know! Ed has THREE Super Bowl rings. And lots of mustard money. Thank you! I watch a lot more of your football these days. Women’s World Cup was so enjoyable. Turn it into a book? Well, question for you — how do you like Wattpad? Ah, good to know. I saw that Wattpad really worked for Taran Matharu of “The Novice” and so I wondered. Oh, I didn’t know that. o-o I’ll check it later.